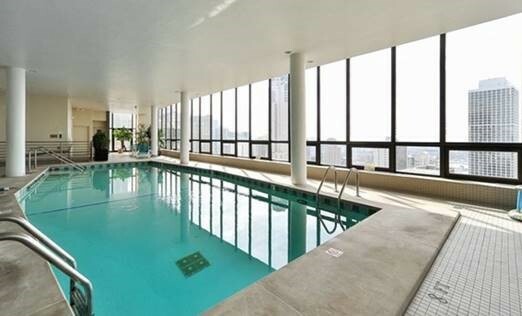 Located in the heart of Chicago’s desirable residential Gold Coast area, the Carlyle was the first new construction condominium building to be erected on Lake Shore Drive. 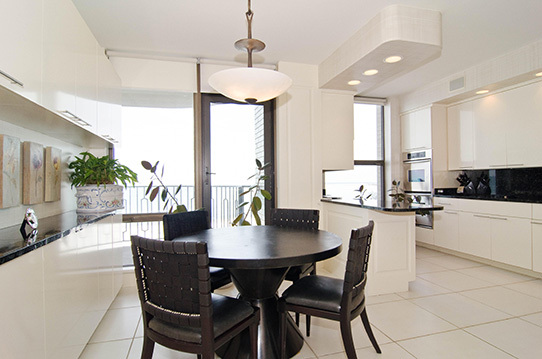 Today, the luxurious 40-story tower with its 130 homes is renowned for its elegance and impeccable service. 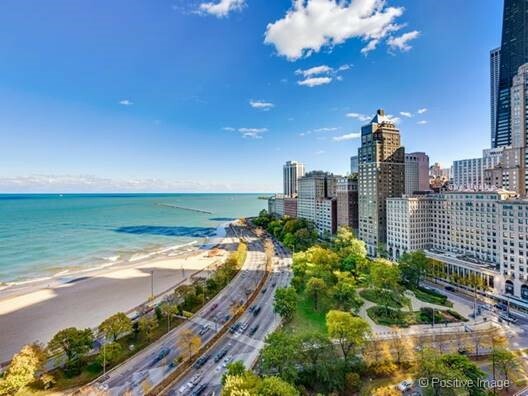 One full block frontage on Lake Shore Drive and only one block north of the Drake Hotel, Michigan Avenue and its Magnificent Mile every residence in the Carlyle has unobstructed breathtaking views of Lake Michigan, the beaches, park, and East Lake Shore Drive. The Carlyle’s many gracious amenities include a rooftop ballroom with a caterer’s kitchen, an indoor swimming pool, exercise facilities, his & her steam rooms, rooftop outdoor decks, valet and guest parking, 24 hour doormen, and a staff of 39 to accommodate and care for the residents. Over the years the Carlyle has been home to many illustrious Chicagoans including Arthur Rubloff, Jovan Cosmetics founder Bernie Mitchell, “Mr. Chicago” and his wife Irv and Essie Kupcinet, Chicago Bears quarterback Sid Luckman, Morris Belzberg (former owner of the Pittsburg Penguins), and Sidney Port – to name a few. 1040 Lake Shore Drive has long been an elite address, in large part because it was built with comparatively large floor plans. Even the one bedrooms are bigger than most three bedrooms on LSD. And typically, Carlyle residents either move from a smaller to a larger condominium. Or vice versa. One of our clients has lived in the building for many years and is now moving into her third Carlyle home. The apartment she has lived in is a stunning 3,500 square foot, 3 bedroom, 4.5 bath home with abundant – approximately 70 lineal feet – closet space! This home has room for everything and more. Similar to today’s newer buildings, many walls that defined the original layout have been removed to create an open space plan. Open to the living and dining rooms, the bleached Oak paneled foyer was manufactured by Parenti and Rafaeli – one of the Chicagoland’s finest millwork studios. Partition walls separating living and dining rooms were removed before the owners occupied this residence. There is a library adjacent to the combined space. The butler’s pantry was integrated into the ultra-bright kitchen which offers plentiful storage space. Two bedrooms were combined to create a luxurious master bedroom suite with dual ensuite baths, a huge walk-in closet and additional space for storage. For sale through Margaret Carlson of Berkshire Hathaway Koenig Rubloff Residential Real Estate, this exceptional home will not remain on the market long. 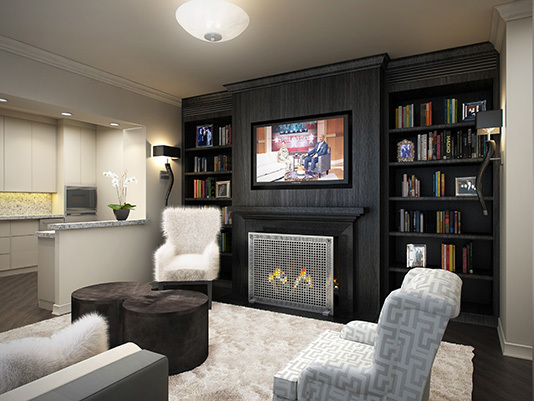 Meanwhile, here’s a peek at renderings of our client’s new home at the Carlyle. We are transforming the dining room to an intimate library. A custom built-in wall showcases a honed black granite fireplace flanked by bookcases stained to match the wood floors’ charcoal hue. The white fur wing chair and pillows add warmth and style. 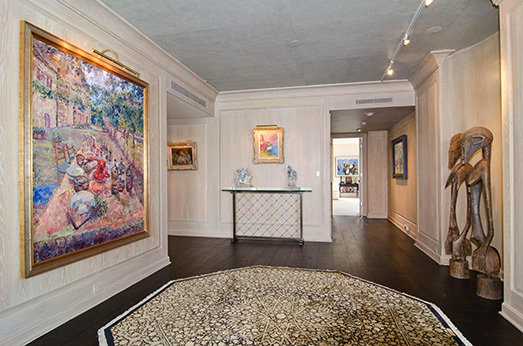 Our client requested a glamorous master bedroom ala Jean Harlow, the original blonde bombshell of the ‘30s. We discovered a fabulous pair of Art Deco, mirrored drawer chests near London. We will add black granite tops as soon as they arrive. Coupled with the platinum finished plume glass sconces, they create an elegant, sophisticated yet functional mood. 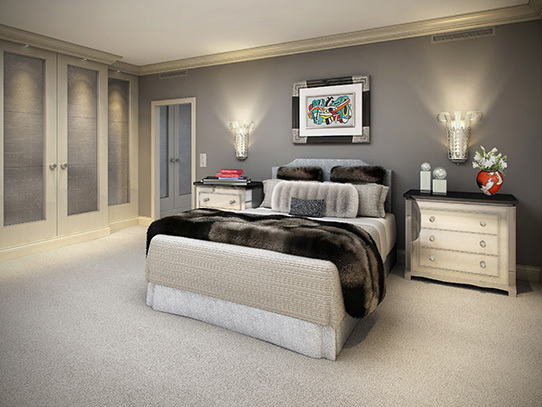 We dressed the bed in a combination of luxe fabrics including a fox throw and ermine pillows. That’s life at the Carlyle. I don’t know if you’re aware but the Carlyle was designed by our firm (then known as Hirschfeld & Reinheimer) in 1962, long before I joined Martin Reinheimer’s office in 1978. I heard some interesting stories about it from Marty Reinheimer. 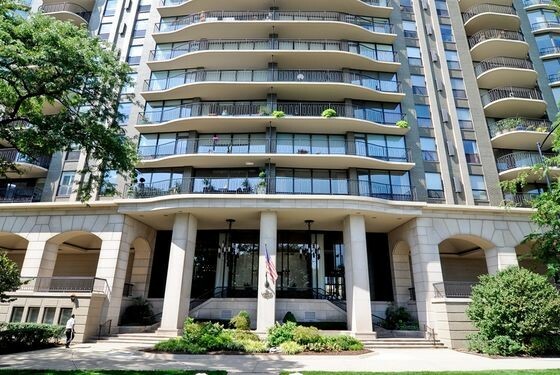 It was the first luxury condominium built since the 20’s and he recalled that people had ridiculed the idea at the time by proclaiming that “no one will ever be willing to pay $65 a foot to live on Lake Shore Drive”. Despite that observation, the building sold well. I’d be happy to share some of the tales other from those days with you when you have the time. One of my friends lives there. I will forward this to her. Hope you had a good trip. Just beautiful, John. Love seeing your work. STUNNING!!!!! Thank you for sharing that with me. Hope all goes wonderfully well for you. Thank you for sharing. Please let me know how I can help with the new residence. Keep sending the emails, it really brightens my day!! I hope that you are doing well, stop in sometime, I miss our conversations. Good morning John. I owe you an email and will touch base with you next week. The condo feature is beautiful. 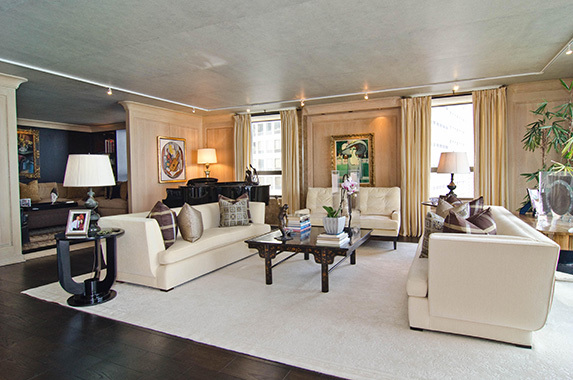 I love the Carlyle and have been in many of the units over the years. It is one of the best in my opinion. Thank you for keeping me on your mailing list. I always read your emails with great interest and excitement. Although, I am not a “Chicagoan”, I find these mails very much inspiring and didactic. Take care and always be happy and heathy. Hello John – this looks amazing.